She was in good hands, whether she knew it or not. My cell phone awakened me this morning, in the other room, me stumbling for it, not a morning time gal, a message from Robert "I have an owl on my hand", a glance out the door and I see him across the street, so pjs & all, I am there too, with 6 other adults, all ooohing & aaahing at this baby. Fallen from her tree, and almost breakfast for Charlie the cat, but rescued, Robert climbing trees to try to find a place she would stay, but she kept falling, kept trying her wings & falling. Finally Robert placed her on the garage, among the overgrowth and low limbs. Safe. Finding the magic again - step 2.
oh my gosh ... pure beautiful magic!! :-) soooo cute!! so beautiful and wise looking already! love the amazing moments that nature provides. there is a terrific book out about wesley the owl that is a fast enjoyable read. Darlene - As much as the cell phone awakening was heart-stopping, it was so worth it. The parent owls were hovering overhead, so I have hopes she will be okay. OH! This is simply magical! You have brightened my entire day already! oh my goodness. that is the most amazing thing to see. so adorably - he looks unreal.i hope he'll be ok - wonder why he kept falling. he looks scared to death in that second photo. I just got finished reading a book about a snowy owl that had a damaged wing, brought back to health and let free again. what a way to awaken....in the morning ......and the magic! SYW - She/he keeps falling because she/he hasn't quite got the flying thing figured out yet. A few inches in the air & then whoof - down to the ground. As long as she/he stays in the trees, things should be fine - she/he didn't appear to be really hurt. Mad, yes, scared, yes, but I'm thinking okay. What an adorable little owl!! My kids really enjoyed looking at the pics with me! Love the pictures! 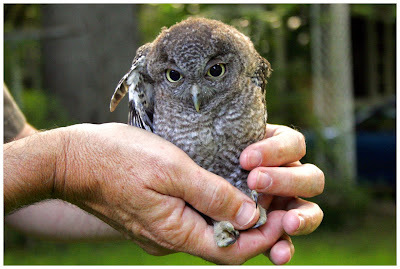 Such a sweet little face - and a very lucky little owl it sounds like. Wanted to check in with you about getting my Live piece. I'm excited about finding a place for it! What's the best way to meet up? oh wow :) i can hardly believe her/his luck! to find these particular 7 adults, 4 cameras and no cats is extremely fortuitous. pooped and bitten is a small price. thanks for watching over me my dear friend. and the magic is back. Thank God. How cute. 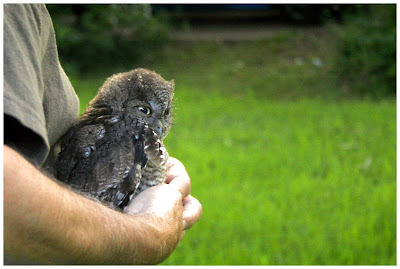 I have never seen a baby owl! Loved the pics. oh my gosh, what a darling! 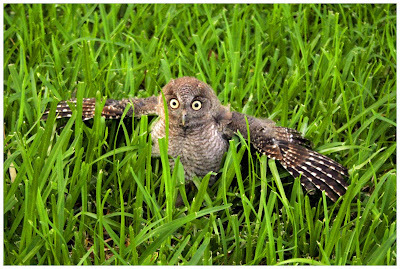 that second photo with those wide eyes and frantic wings just stole my heart. Pure magic! Can I have one? 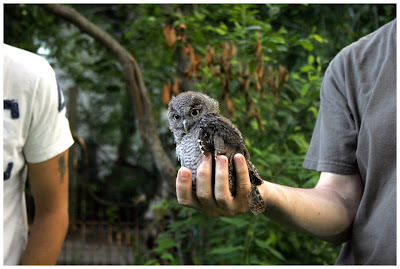 Can I hold a baby owl? Just for a minute or two? What an incredible gift! 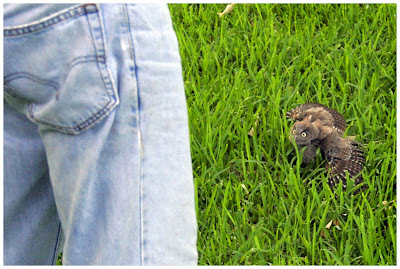 How many people get to have such an up close and personal experience with the elusive owl?